I spent my teenage years in a third world country. Running water was a luxury. Hot water was an extravagance. Shoes were optional for some but far too expensive for many. Flip-flops were considered shoes. New flip-flops were considered pricey on a tight budget. Hot loaves of bread? Yes, comfort food and in high demand. But in most parts of the country, the only bread you saw regularly on your table was breadfruit – definitely not the same. I can go on and on about the things that we all take for granted and to be fair, Samoa is now matching modernity stride for stride in this technologically advanced age. But living in that faraway place all those years ago, a place that I now tenderly still refer to as my home, I was able to cultivate a heightened sense of awareness for things that I had once taken for granted. It was my education in the importance of gratitude. When asked what the single most important thing they were grateful for in life, a group of youths almost unanimously stated that it was their family and friends that they treasured most. When asked why, they could not pinpoint a specific reason only that they were grateful for everything that their family and friends did for them. One can hardly fault teenagers for a canned response because in truth, I’ve asked a group of adults the same question and the answer was again unanimously, family and friends. To what can we attribute the lack of introspection in a word that conjures up raw emotions? Could it be that asking such a personal question in such an open and public forum makes people squeamish? I find that answer hard to believe given the types of things the average person posts on Social Media websites. But it can be argued, given the nature of our society to praise strength and independence, that things which portray us as “weak” sends the wrong message to the world about us as individuals. Which brings me back to this point – Why is it that a boy living in a third world country can articulate gratitude for the most rudimentary and modest things but we can hardly communicate why our family and friends mean so much to us? Because we are so concerned about the daily pressures and strains of life that we forget to take a daily inventory of the things that we should be grateful for and in part, this attitude makes us jaded to the things that give us a true sense of focus and understanding when dealing with gratitude. How do I know? Because I’m living proof! On the days when, through my inattention and carelessness, I forget to be grateful for the simple things that helped me survive the day, I realize that I emphasize the negative things in my life rather than underscore the blessings I’ve enjoyed throughout the day. Gratitude elevates our joy; ingratitude profoundly diminishes our quality of life and highlights our sorrows. 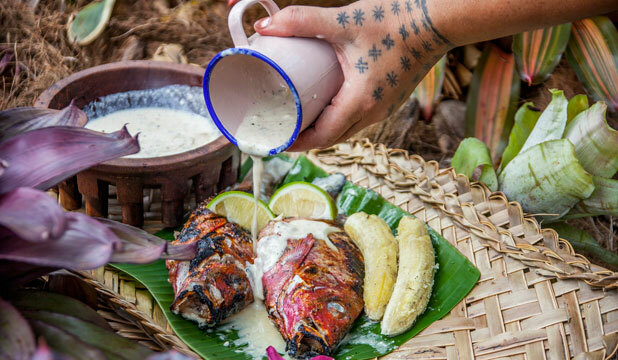 A typical Samoan spread: Fish, fa’alifu fa’i and coconut milk. As a young man sitting in a rural village on the island of Savaii I recall sitting down to dinner in a humble little Samoan hut. As the plates of fish soup were passed around to all in the house, one of the young kids groaned under his breath, “Fish again? I’m so sick of fish!” Without missing a beat his father replied, “I would make you starve without food tonight but that would be disrespectful to the fish. He lost his life so that you could be ungrateful for eating him.” Sadly we can be a lot like this boy who discarded the sacrifices his father made to brave the ocean in search of fish and the time that his father spent growing crops to make sure that his family did not go hungry. We diminish the minor blessings while waiting for something truly monumental in order to be grateful and content. Do we need to live in a third world country to fully appreciate our blessings and show gratitude? Absolutely not; we only need to take a deeper look at the basis for our gratitude. If you say that you are grateful for your family, count the ways you are grateful. Each day that you spend taking a personal inventory of the things that you are thankful for, no matter how trivial, will increase your happiness and your capacity to love and show love towards others. Today I’m grateful for these new cleats my wife bought me. I used them Thanksgiving morning and they helped prevent serious injuries, which would have meant medical bills and time off of work. Today I’m grateful for rugby, because it gives me something that me and my boys have in common besides blood and our family tree. Today I’m grateful for our friends Rebecca and Canton who regularly share their table and good laughs. Today I’m grateful for my employer. Being employed is a blessing and work is a blessing. It also helps to have a super intelligent and understanding boss. Today I’m grateful for each of my sons. Today I love #1 for his determination, #2 for his cheerful disposition, #3 for his humor, #4 for his honesty and #5 for his loyalty. Each day they are my teachers. I’m especially grateful today for my wife’s humility, her wisdom and her beauty. I’m undeserving. Today, and every day, I will cultivate my attitude of gratitude. Will you?